Islandz to open for testing! Former InWorldz users… we’ve all been waiting for this; now it’s here. Tomorrow (Wednesday, November 14) at 3pm Islandz time (6pm Eastern time), the Islandz grid will enable logins. There’s not much to see yet, but at least you’ll be able to log back in and upload things, etc. There is a welcome region called Islandz Welcome Center (IWC) which is a work-in-progress, with ocean regions around it for sailing or flying, plus an Islandz Beta 1 region for testing, which has sandbox semantics: open build with a 4-hour auto-return. There are no avatars yet, and no inventory for anyone, except some preliminary uploads over the last day or so by a couple of early beta testers. There is no currency yet, so no commercial sales, no region recovery yet (from saved InWorldz OAR files), and thus no real content yet. But there is a sandbox and multiple regions and upload capability and user accounts, so it’s a start. Whether you choose to enable your account to be recovered or not, you can also also choose whether to opt-in for allowing any of your creations to be recovered from the region backup (OAR) files saved before InWorldz servers were shut down. Note that currently there is no way to rerun the opt-in choices once your account has been created, although this is planned as soon as priorities allow, so please read the choices carefully and try to choose wisely according to your needs and desires. That said, it’s possible for Islandz Support to manually update it if you change your mind before that feature is available. Note also that there is no support yet for new user registrations. (Any attempt to register will produce an error.) Only recovery of previous InWorldz user accounts is possible currently. 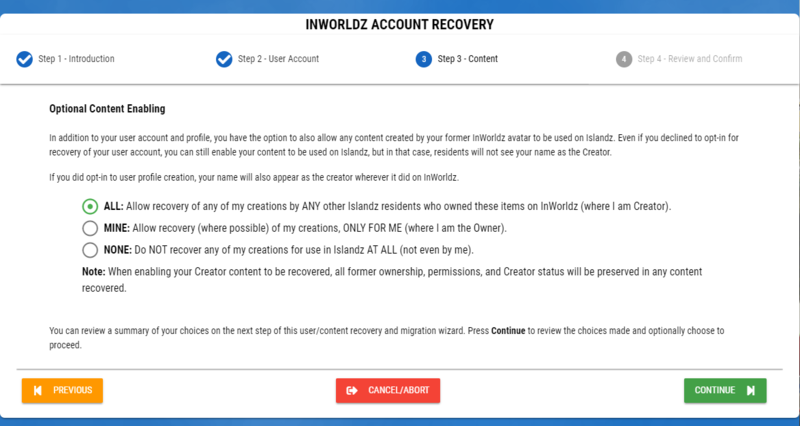 Once you run through the two choices in the InWorldz user/content recovery wizard and Confirm, you then have an Islandz account (if you left the account recovery box checked). At this point you can log in to the main website at https://islandzvw.com/ or from there open and log in to the Zendesk-based Islandz forums and support site. Currently there’s not much on either, but that is expected to change very soon, especially in the case of the forums! On login and account migration, only the first two choices are enabled, but as you can see, there are plans for many features from this app. Note it will be available as this website, but also as a standalone desktop application for Windows, MacOS X and Linux. 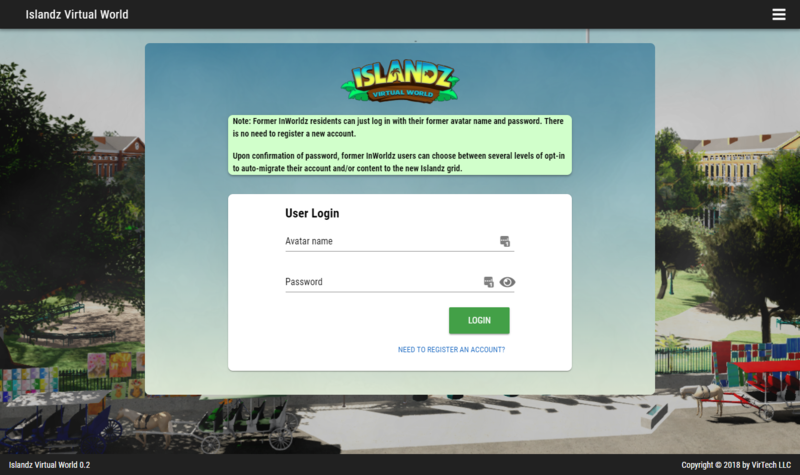 Logins are currently restricted to a small number of beta testers, but the gates will open at 3pm Islandz time (6pm Eastern time), tomorrow, Wednesday November 14. To log in when the time comes, either download and install the new Islandz viewer from the main website‘s Downloads page, or use any OpenSim-compatible viewer such as Alchemy or Firestorm. If using the Islandz Viewer, the Islandz grid is already in the list and the default destination. If using a third-party viewer, Islandz grid can be added in the Preferences form under the ‘Grids’ tab (in Alchemy) or the ‘OpenSim’ tab (in Firestorm). 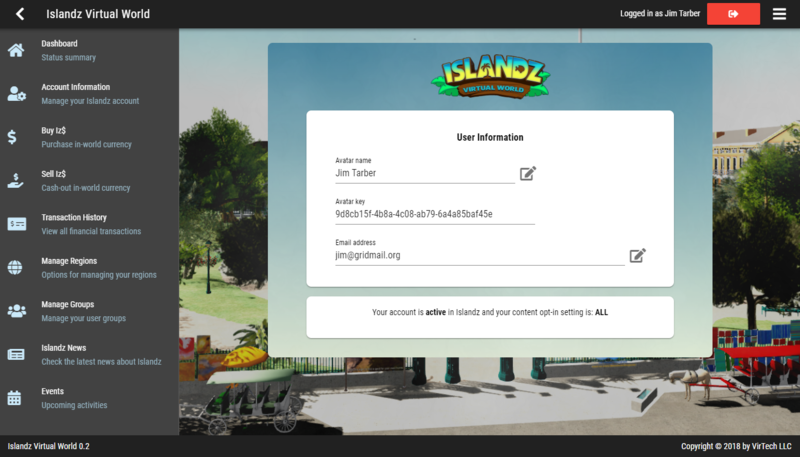 If Islandz is not already in your list, you can enter this login URI to add it: http://login.islandzvw.com:8002/ and press Add. The welcome center, the websites, and the grid installation is still rough in a few places. It’s not really ready yet, but with the regions up and running, and user account migration in place, it didn’t seem right to make people wait even longer until it was more polished. Please bear with us while we tidy up, but welcome aboard! And see you tomorrow at 3pm Islandz time!